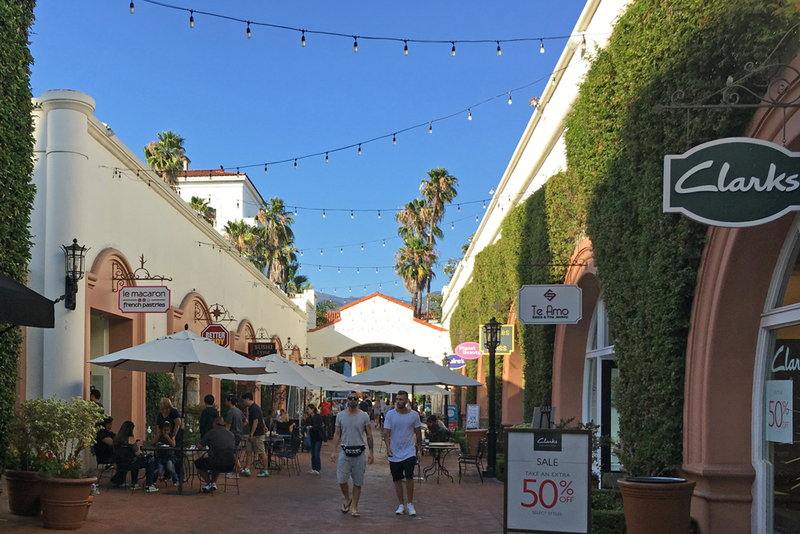 Despite the decline of some major national retailers and the vacancy rate of State Street, Paseo Nuevo management said Santa Barbara’s downtown mall is experiencing strong financial health. Paseo Nuevo has focused on a successful pop-up shop program, with new retail experiences every week, said Mary Lynn Harms-Romo, marketing and specialty leasing manager. “This program has flourished this summer and has contributed to our nearly 100-percent occupancy,” she told Noozhawk. Five new stores have recently opened in Paseo Nuevo including Yes Dance, Saje Natural Wellness, Santa Barbara Souvenir and Apparel, Poke Ceviche and 2bella clothing. In addition, the mall is planning on “repositioning and investing” to enhance the guest experience, but is not yet revealing those specific plans. Paseo Nuevo recently lost Macy’s as one of two anchor tenants in the downtown mall, which was built in the 1990s as part of a massive city redevelopment effort. Along State Street, where the mall sits, retailers and restaurants are leaving the space, a result of escalating rents and online competition, among other things. On a national scale, Amazon and online retail have wrecked traditional retailers. Sears, Macy’s, Radio Shack, Gymboree and JC Penny’s are just some of just some of the retailers that have filed for bankruptcy in the last year. The Paseo Nuevo Macy's was one of 100 stores closed by the chain this year. Harms-Romo said there is no update on plans for the 141,000-square-foot building. “The Macy's building does not affect Nordstrom and they are here to stay,” Harms-Romo added, referring to the other anchor store of Paseo Nuevo. As to online competition, she said malls, including Paseo Nuevo, will have to adjust accordingly. “It is up to retailers to evolve with the changing retail environment and create relevancy for themselves,” Harms-Romo said. Paseo Nuevo hosted flamenco and music performances during Old Spanish Days as part of that effort. “Creating a gathering place, providing unique retail and sharing experiences with our guests is at the forefront of the evolving storefront,” Harms-Romo said.